Dan Roberts - Website Design Project by Metal Potato.... Let's Do Launch! Dan Roberts is one of the most respected celebrity trainers in the world. His “athletic lifestyle” focuses on loving life, loving food and loving fitness. So when he needed a modern website to reflect that global brand—one he and his customers would love— he chose to put our team at Metal Potato through the paces. With a well-known client featured in places like VOGUE, Men’s Health, and Elle, the bar for Dan Robert's new website was set high. Like all of our websites, the new Dan Roberts Group website is built on a versatile, WordPress-based content management system. That gives Dan’s team the flexibility to adapt with changing web trends and the ease-of-use to add content to the site on their own. 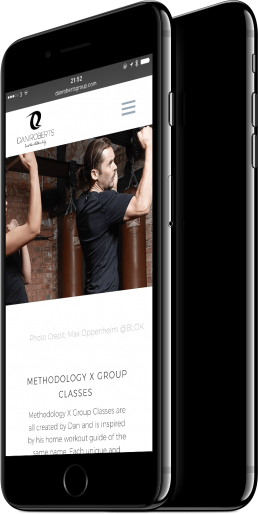 And because Dan’s new website is enhanced with WooCommerce, his crew can also sell his fitness courses quickly and easily online. To make sure Dan's website is online 24/7, from London to Miami and everywhere east or west in between, we’ve set Dan up with a Potato Care hosting plan that provides cloud-based hosting services that offer the best in modern security. I can’t recommend Metal Potato enough. We needed a new bespoke website developed that suited the stature of our brand. The ‘Spuds’ not only over delivered in terms of build quality but their patience and proficiency of working with multiple members of my team at anti-social hours was both appreciated and impressive! As with any high quality service, it’s the little unexpected extra touches that are most appreciated; from regularly checking in to see everything is okay, making useful design suggestions to even creating how to videos for the back office – it all highlights how much Metal Potato care about their customers! We shall continue using this company 100% on our future website development projects.